As part of an upcoming change of scenery in a Star Wars (legends) RPG, our party, including a 3PO-series droid are off to a planet covered almost entirely in water. It's fairly relaxed, but we like to stick to the given knowledge of the Star Wars galaxy where possible. In Empire Strikes Back, we see that R2-D2 can function underwater, even if he does get a little waterlogged, but I can't assume that C-3PO (for example) would fare similarly. My question is; could protocol droids like C-3PO survive being submerged in water? Are there examples of this happening in novels, TV shows etc. I might have missed? I'm happy to take Canon answers if there is nothing in Legends. Kell stared out into the darkness, noted the clustered pinpoints of red light that floated in the pitch. He shifted on his feet as the lights drew closer—a silver protocol droid. He attuned his vision to Fate, saw no daen nosi. Droids were programming, nothing more. They made no real choices and so had no lines. The false sentience of the droid unnerved Kell and he cut off the perception. The anthropomorphic droid strode through the wind and rain to the base of the landing ramp and bowed its head in a hum of servos. and again, in The New Jedi Order: Force Heretic II: Refugee. Note that Threepio seems entirely unfazed even when the rain comes down in "great sheets". Han and Jaina also turned to look at C-3PO now. As if in response to the droid’s words, a peal of thunder rumbled from the tropical sky. Fat raindrops began to splatter his metal cranium, turning what dust was there to a reddish mud. “Threepio, are you sure about this?” Leia asked. Rain began to fall in great sheets across the stadium as the sides of the troopships opened, issuing ramps. Jaina squinted to see through the rain, trying to make out what lay inside. 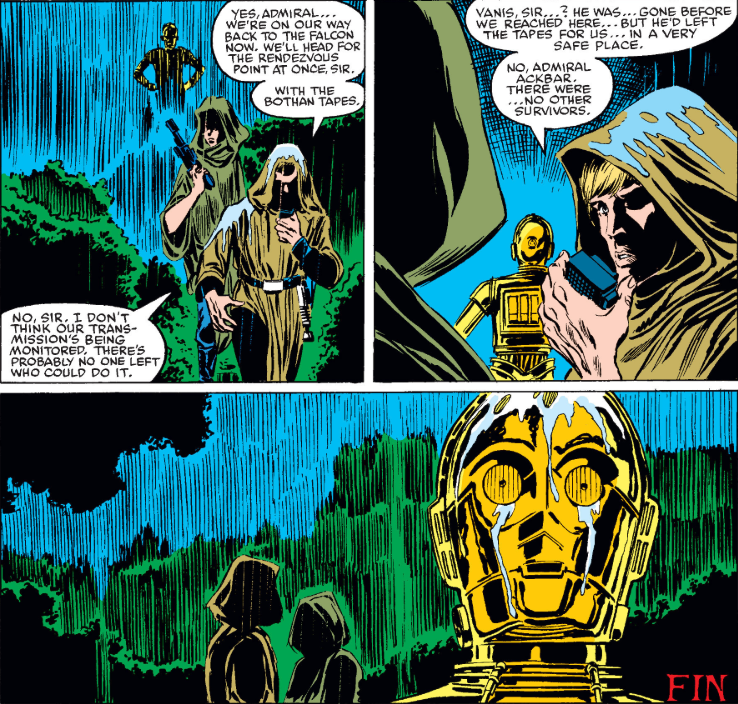 And in the 1983 Marvel comic story Ellie (Star Wars #80) C-3PO is seen standing in rain. Not the answer you're looking for? Browse other questions tagged star-wars star-wars-legends c-3po or ask your own question. What are droids in Star Wars powered by?